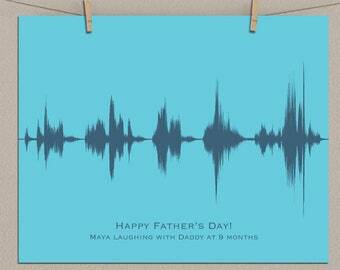 A great personalized Father's Day gift. 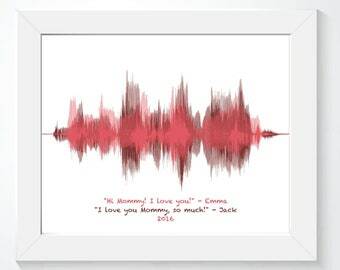 This custom sound wave print will express your love for him in more than just words, he will be able to see and hear your "I love you" for years to come. 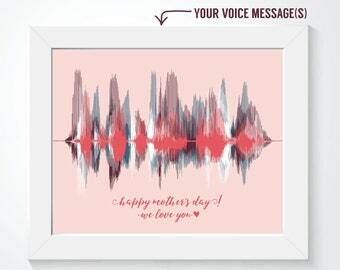 You can add extra recordings in different colors to include messages from everyone in the family in their own voices. ★ QR CODE CARD - A 4x6 card printed with your QR code will be included. When scanned with a QR reader app or your phone's camera, the recording for your order will play. 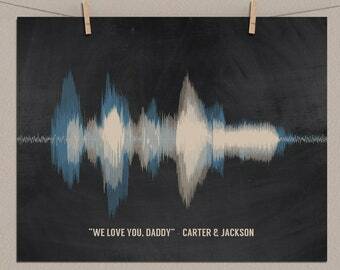 beautifully rendered artwork, it was the perfect memorial gift. Very fast and great product! This was not only a great idea, but very well executed. I wanted something unique for our first anniversary with a baby, and this more than fit the bill. The artist worked with us to customize it, and made it really special. Payments may be made with any Credit Card via Direct Checkout, PayPal, or with an Etsy Gift Card. If for some reason you are unhappy with your purchase, please contact me within 14 business days of receipt. 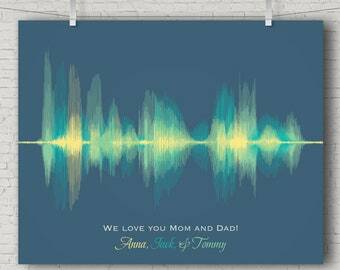 It is my utmost priority to accommodate you and make sure you love your sound wave art. If your order arrives damaged or is lost in transit, please contact me immediately and provide a few pictures so I can send a replacement item. Please allow at least 2 weeks for US and 4 weeks for International orders before reporting them as lost. All orders are shipped with a tracking number via USPS, UPS, or FedEx. Expedited shipping is available at checkout for an additional fee. How do I send you my recording or song? What file types are acceptable? Please email your recording to artsyvoiceprint [at] gmail.com with your order number in the subject line. For songs, you can email an MP3 file of the song or add a link to the song on YouTube along with your order details when checking out. I can use any audio or video file format. 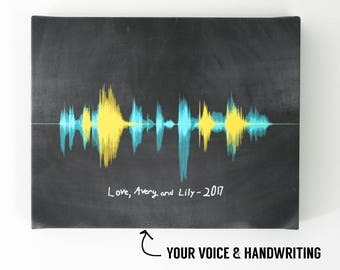 How do I record my voice message or my baby's heartbeat? The easiest way to record your message is to use your phone's Voice Memo or Voice Recorder app. You can email the file directly from your phone. You can also use your phone or camera's video feature to record (while pointing the camera anywhere) and email me that file. The easiest way to obtain a recording of your baby's heartbeat is to use your phone's Voice Memo or Voice Recorder app at your next doctor's visit to get 5-20 seconds of the heartbeat sound. Don't worry if there are any background noises or talking in between as I can edit those out if needed. 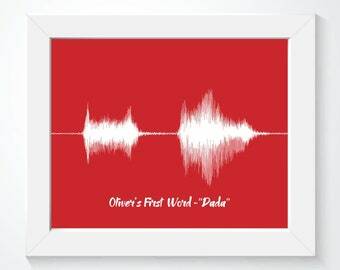 I can also create your baby's heartbeat art using an image of the highest possible quality scan or picture taken of the ultrasound printout or monitor. Is there a limit for the length of a voice recording or song? There is no specific limit, I can fit any length on any size. What will be affected is the compression of the sound waves. 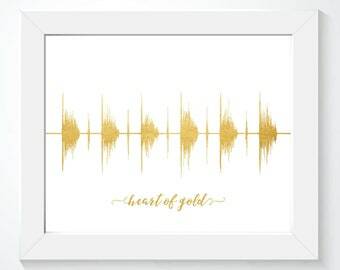 The shorter the recording, the more detail you will get in the sound wave. For voice recordings - I recommend 1-3 phrases or up to 15 seconds for the best results, but you can certainly capture a longer message and many customers do. For songs - every song looks different. The more acoustic a song, the better it will look as it will have more peaks and troughs in the sound wave. If you're not sure about your selection or if I see that your song looks like a long block, I will send you a preview before printing and you can choose a shorter verse or line. My recording is not the greatest, can you edit my audio file? Yes, I have a lot of experience editing sound. I can remove extra sounds or reduce background noises, piece together, or amplify your recording as needed. I can also use only certain sections of your recording or song, please be specific and provide the start/end times whenever possible or describe what part to use or omit. It is rare that I cannot use a recording, in that case, I will notify you and provide options. What if my video file is too large for email, how can I get it to you? You can trim the video down to a smaller clip and attach it to an email. If it's still too large, the best way is to upload it to Dropbox, Google Drive, or WeTransfer and share the file. If that sounds too complicated, you can also record the sections you want on your phone while the video is playing on your computer or TV (it's best to use the voice memos or voice recorder app on your phone) and email that file to me right from your phone. Can I add more than 1 recording on my print? 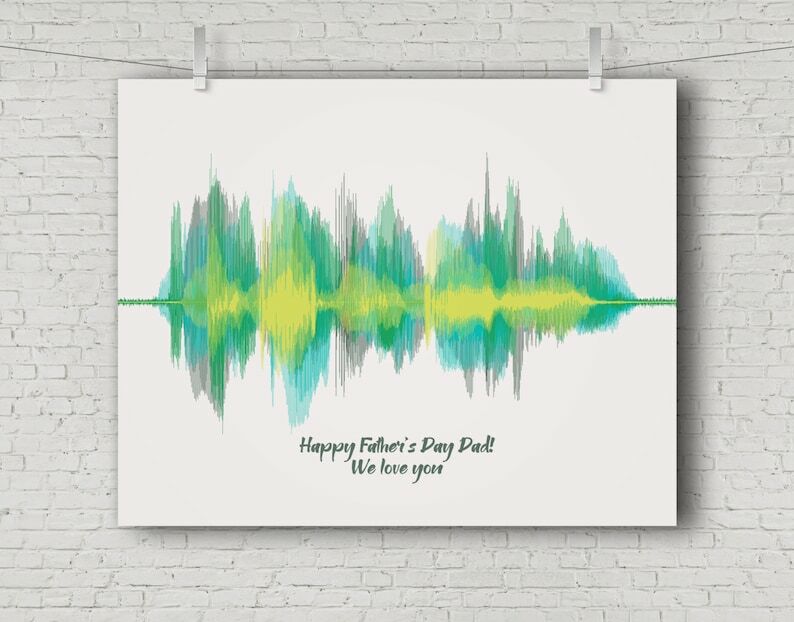 Yes, adding additional recordings to your print creates a multi-color artwork that has more depth. There is a $12 fee for the first recording, each additional recording is discounted. You can choose the colors for each sound wave. You also have a choice to overlap the sound waves on the center line, place them individually on multiple rows, or position them side by side. You may add extra recordings to any listing in my shop using this link. Or, simply purchase a listing that has multiple recordings as the example and choose the number of additional recordings you want from the drop down menu. What is a QR code? How do I play the recording on the QR code card? A QR code is a scannable code that will play your recording when scanned with a QR Reader app on any phone or tablet. I send you a 4x6 card with the QR code printed on it. There are many free apps that enable you to scan QR codes. Search 'QR Reader' to download an app or use your phone's camera to scan. Can I preview the art prior to printing? Yes, if you want to proof the art, please leave a note when checking out and I will send you a preview for your approval. Please consider that requesting a proof can delay your order if I have to wait for your response. 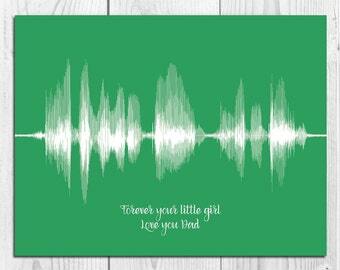 Yes, I offer printed gift certificates for custom voiceprints, song prints, wedding vow art, and baby's heartbeat art. 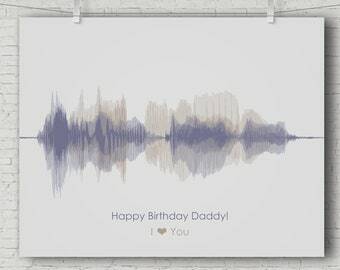 You will receive a gift certificate printed on a 5x7 folded card with instructions for the recipients on how to redeem and personalize their custom sound wave art. 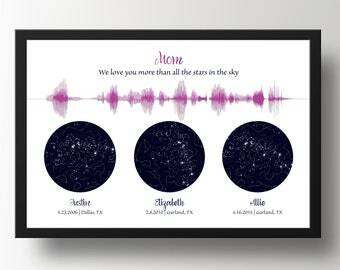 You can choose what size print you would like to gift from the drop down menu for each listing.